Ride the scenic Bergen and Flam railways to a secluded farmhouse in the Lapp wilderness. 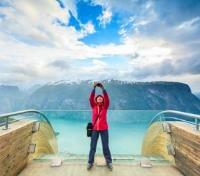 Hike the mountains to the beautiful Turlidfossen waterfall and Stegastein scenic overlook. 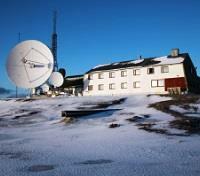 Visit Isfjord Radio; an isolated communications outpost converted into an exclusive hotel. Explore the barren landscape of Svalbard with an eye peeled for the elusive polar bear. Two empires live inside of Norway, the glacier-carved fantasyland perched between northern Europe and the Norwegian Sea: the winter kingdom, blanketed in snow, and its summertime rival, a short-lived domain of green meadows warmed by the Midnight Sun. This exclusive Explorers Club Collection summer edition experience spirits travelers deep into the fjordlands at Norway’s heart, and the thawed Arctic wilderness at its edges. Please note, the travel window for this journey is June to September. Meet your private taxi at the train station in Flam for a transfer to Aurland. Approximate travel time is 15 minutes. 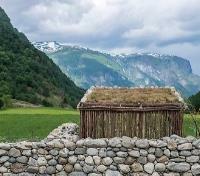 On arrival in Aurland, enjoy a welcome drink and late lunch in the Smokehouse, then embark on a guided walking tour and introduction to the Aurland 29/2 farm, the local history and nature, with an easy hike of the surrounding area. This will give your hiking guide a chance to get familiar with your abilities prior to tomorrow's hike through steeper terrain. 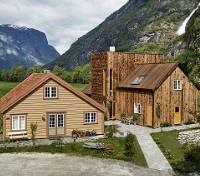 On an area settled since the Viking Age, 29/2 Aurland is a riverside farm lodge offering traditional living in style. Modern architecture and creativity prevailed in the careful one-by-one restoration of the buildings on the farm, including the 18th century fisherman's cabin, in the hopes that guests will get a feel for the history of the farm and the local community through the walls that surround them during their stay. 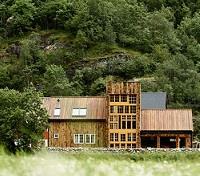 The latest addition to the hotel was built on the site of the farm's old goat barn, offering a very tasteful blend of traditional cog-jointed 18th century smokehouse aesthetics from the Hardanger region, with 29/2's own modern flair. The Riverside Farm Lodge features five guestrooms, decorated with old, traditional colors and a mix of historic and modern furnishings. Dine in the old Smokehouse, then sit in the hot tub outside the lodge and simply take in the incredible natural landscapes before you. Meet your private driver-guide after a lovely breakfast and get ready to embark on a half-day hiking excursion either to the picturesque waterfall Turlidfossen ending at its companion viewpoint Stegastein, or to one of the summer barns in the mountain. 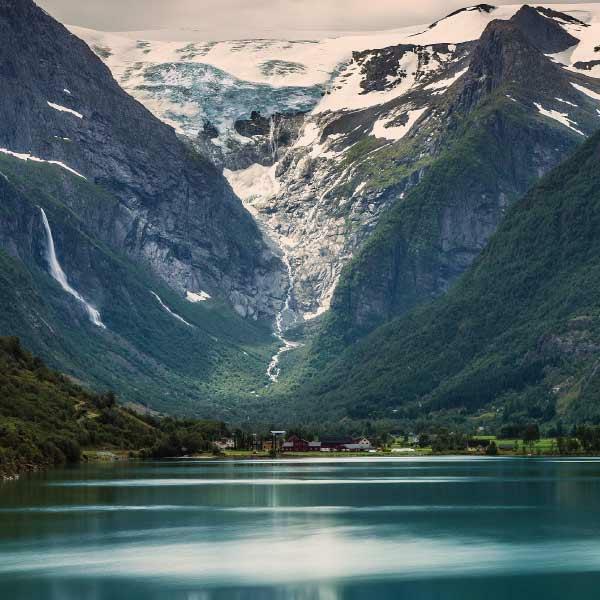 Take in the serene sights and beautiful vistas as you push out into the Norwegian wilderness. Your experienced hiking guide will gauge your fitness level and make a recommendation accordingly, and you'll be visit an organic bakery for some fruit, baked goods, and coffee/tea during your excursion. Meet your private taxi for a transfer to the port in Flam. Approximate travel time is 15 minutes. 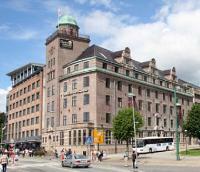 Meet your private driver and vehicle for a transfer from Gudvangen port to Bergen. 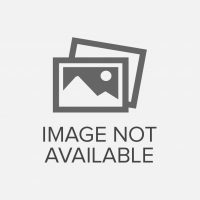 Approximate travel time is 2 hours and 15 minutes. Board a flight in Bergen en route to Longyearbyen. 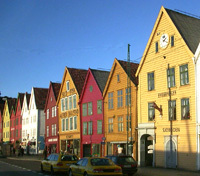 Approximate flight time is 6 hours, with a connection in Oslo. 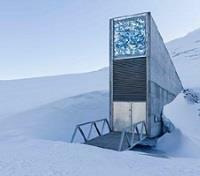 Departing the airport with a private driver and vehicle, you’ll head out with your guide to pass the Svalbard Global Seed Vault, a place of extreme global importance. Learn of the critical work being done here, collecting and archiving seeds of all of the different plants on earth in an effort to preserve all existing flora, in case of a global disaster. 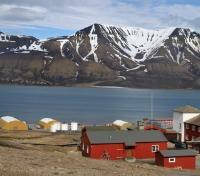 You’ll continue with a scenic panorama tour of the tiny village of Longyearbyen, stopping for an included local lunch. If time allows, you’ll go for a walk in the village to soak in the Svalbard feeling before concluding with a transfer to the port. Board a special Arctic-built safari boat with your guide for a private transfer to the Isfjord Radio Hotel at Kapp Linne. You'll make stops every so often to allow you to take photos and to hear more about the arctic wildlife, geology and history of Spitsbergen. You pass cliffs teaming with seabirds, and see cute little puffins bobbing up and down on the gentle waves. After being heavily hunted in the past decades, whales and walruses are finally returning to the arctic fjords. So, keep your eyes open! Spend the afternoon exploring the area surrounding the Isfjord Radio Station with your private guide, learning more about the wildlife that inhabits the Kapp Linne area, including the arctic foxes and Svalbard Reindeer. 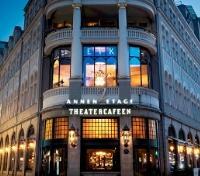 Afterward, settle in this evening for a delightful 3-course dinner at the hotel. After breakfast, you’ll board a safari boat and head out with your private guide on an exciting full day excursion to the west side of the fjord. The route will go east along the coastline before crossing Isfjorden at Kapp Starostin, heading straight to the mighty bird cliffs of Alkehornet, home to thousands of nesting birds. In Trygghamna, you’ll go ashore and enjoy an expedition lunch on the beach. 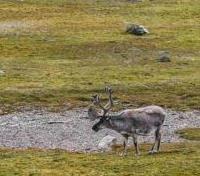 Afterward, you’ll have a closer look at the area before heading to the fantastic Esmark Glacier in Ymerbukta. 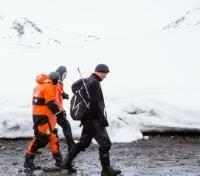 If you’re lucky, you may be able to observe whales, seals or even get a glimpse of “king of the Arctic”, the polar bear. Conclude the day with a return to the hotel. Check out from the Isfjord Radio Hotel, departing by boat with your private guide to Grønfjorden and the Russian settlement of Barentsburg. 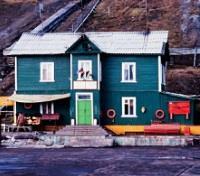 Barentsburg is a small mining city with only about 350 residents. 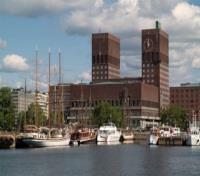 You’ll go ashore and take a tour around town before a light lunch is served in the local brewery. After lunch, you’ll head back to the boat and set course towards Longyearbyen, making several interesting stops along the way. 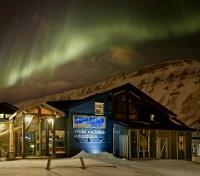 Arrive to Longyearbyen in the afternoon for hotel check-in. 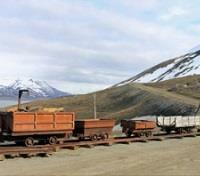 Depart with your private guide and driver for an outing to the Longyearbyen Coal Mines. The drive to the mine is a step through the history of Longyearbyen, getting to hear of how the mining operation has grown into its modern form, starting from the early 1900's and ending in the late 1960's, when Gruve 3 (mine #3) was opened. Once at Gruve 3, you'll dress in miners working clothes, put on a helmet, and stamp yourself in, just like the miners did when they were starting their day. With your headlamp, you can peak around the corners and look for the forgotten memories. Gruve 3 is a living monument to the mining history of the town. The equipment is still standing, just waiting for the next miner to start their day again. Coal wagons are ready to transport workers deep into the mine. Drills and shovels are leaning against the walls, while the workstation of the smith is dusting in a corner. You'll be presented with vivid stories of the everyday life of the miners, hearing the walls whisper memories of the past, and imagining how it was to spend an entire day in the pitch-black mine. Tonight, enjoy an included Nordic Tasting Menu dinner at Huset, a restaurant with Scandinavian flavors and local ingredients in combination with an impressive wine cellar, one of the largest in Scandinavia with over 20,000 bottles. With Arctic nature right outside the door, this is the Huset experience.